Yellowstone National Park was the United States' first national park, and now it is one of the only parks to have a LEED Gold certified building. The Visitor Education Center at Old Faithful opened last week to crowds of visitors looking for more information on the amazing features and wonders of Yellowstone National Park. Designed to reflect the traditional NPS architecture, the state-of-the-art visitor center is also green to the core and features energy efficient design and eco-friendly materials. 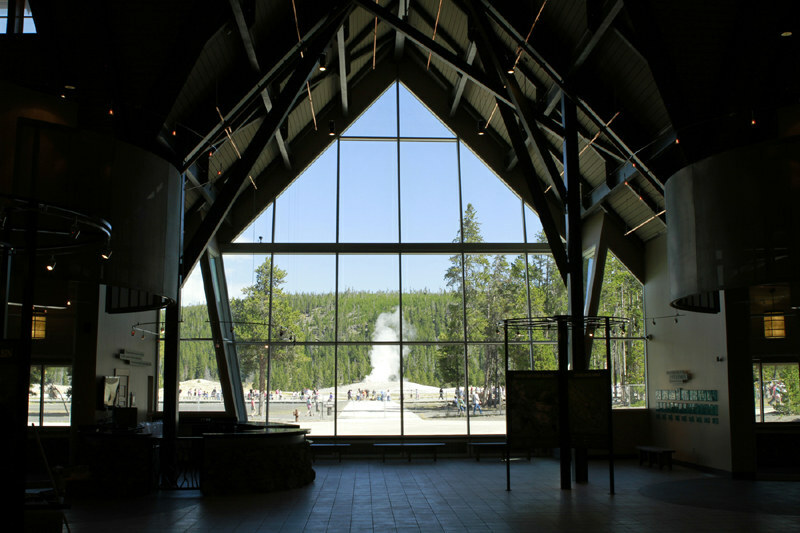 Since four out of every five visitors to the National Park make a stop to see Old Faithful spout into the air, the education center does its best to keep the famed geyser in the limelight. As you enter the facility, beautiful 36.5-foot-high pentagonal windows frame the geyser outside, reminding visitors of the reason they’re there. The educational facility, designed by CTA Architects of Billings Montana, was built to open the minds of the 3 million annual visitors to the wonders of the park. The architecture reflects the look of the surrounding buildings, especially the Old Faithful Inn, which was built in 1904. Construction started on the $27 million center back in 2008 and the builders paid extra special attention to the site, considering that it’s located in a National Park. The old center was demolished, most of the material was recycled, and then the new center was built in its stead. Due to the seismic and geothermal activity of the area, the building’s foundation was both shallow to minimize disturbance, but also robust enough to withstand seismic activity. Inside the new center is a bookstore, a gift shop, a theater for introductory films, a research area and a 4,500-square-foot exhibition space. The Yellowstone Park Foundation, the non-profit behind the project, did its best to make sure that the project is light on the environment and they were awarded with their efforts with a LEED Gold certification. 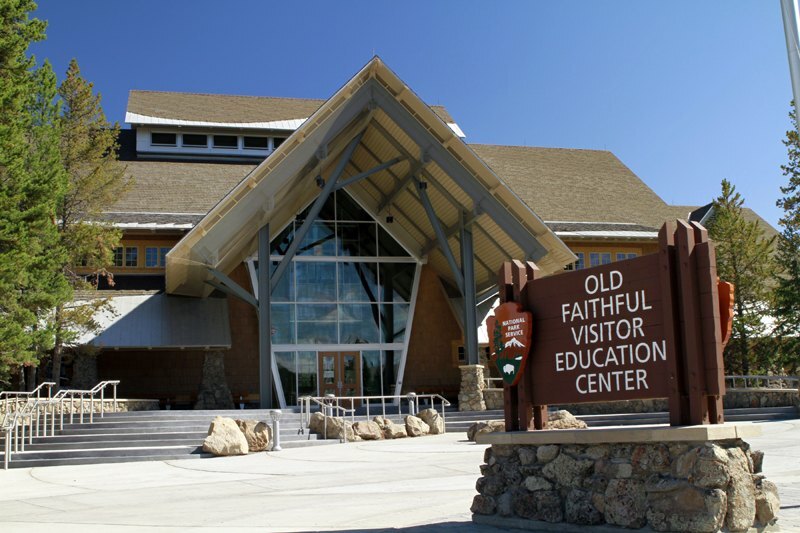 The center is one of the first National Park Service visitor centers to achieve this Gold rating. Besides recycling construction waste, the center has an energy and water-efficient design, uses eco-friendly building materials like recycled steel, and features efficient lighting and climate control systems. 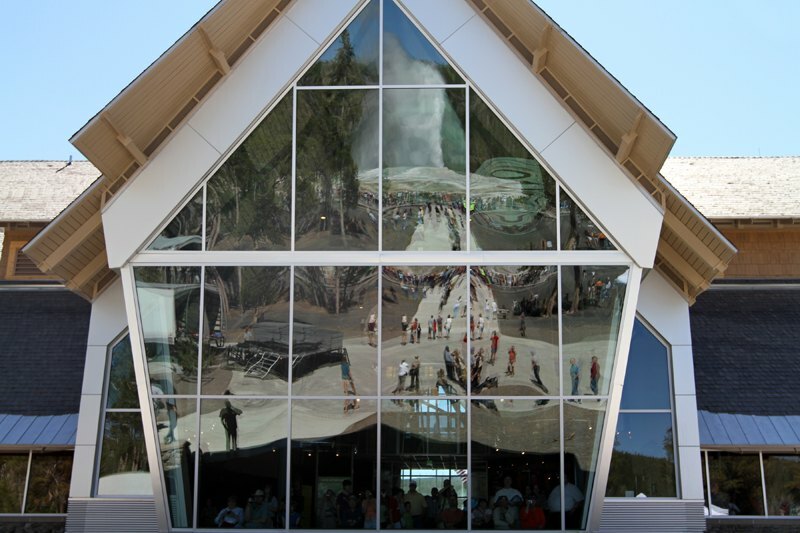 The visitors center opened on August 25th to throngs of visitors. Construction on the center started back in 2008. CTA Architects of Billings, Montana are responsible for the design of the building, which reflects the architecture of surrounding buildings, especially the Old Faithful Lodge. The Center achieved LEED Gold certification and is one of the only NPS visitors centers to do this. The building features energy-efficient design, recycled steel framing, eco-friendly materials and exhibits, site-sensitive design and more. Four out of ever five visitors to the Park make a stop to see the scheduled eruptions of Old Faithful. The state-of-the-art facility includes a bookstore, a gift shop, a theater for introductory films, a research area and a 4,500-square-foot exhibition space. Visitors can come here to learn about the geysers, wildlife, hot springs, seismic activity and all the natural wonders of the park. Exhibits show the native wildlife of the area. Kids will also get a special treat in rooms dedicated to them.